Although this is a far cry from authentic Chinese cuisine, Lo Mein definitely is a perfect Asian inspired comfort dish for those cold winter nights. I've loosely based this on a recipe from Serious Eats, but have added some crunchy vegetables and adjust some of the cooking technique to make for a more satiating dish. 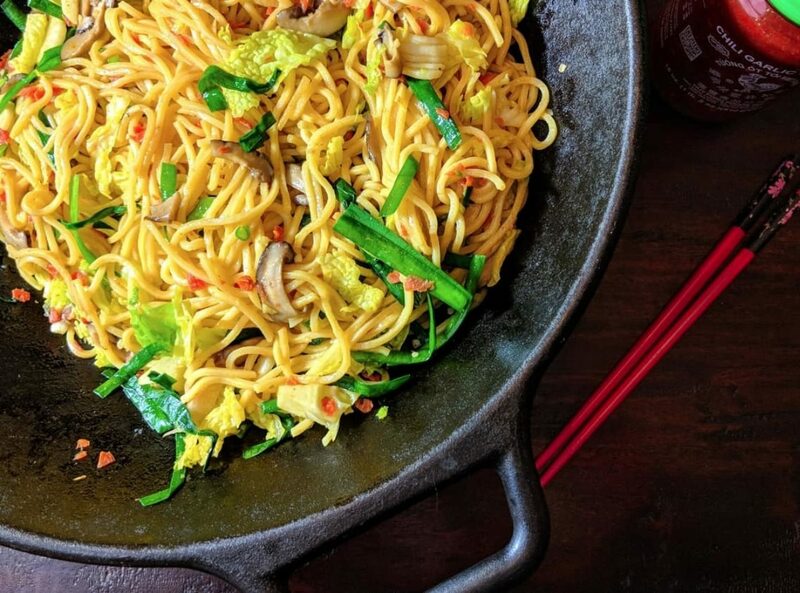 The thirty minutes for the cook time flies by, so I suggest prepping all of your ingredients before beginning in order to easily get from wok to Lo Mein on your plate. Prepare the noodles based on the packaging instructions. Heat 1 tablespoon of the oil in a wok over high heat until hot, add the cabbage, radish and carrot to the wok. Cook, stirring regularly until the cabbage begins to slightly wilt, 3 minutes. Remove the cabbage, radish and carrot from the pan to a bowl and set aside. Heat 1 tablespoon of oil to the wok and heat until it is smoking. Add the mushroom caps and cook, stirring frequently, until lightly browned and the liquid has evaporated, about 2 minutes. Then, add the chives to the mushrooms and cook until they are slightly wilted, about 1 minute. Transfer to the vegetable mixture bowl and set aside. Clean out the wok and return it to high heat heat. Add the last tablespoon of oil and wait until it is hot. Add the vegetable mixture that has been set aside along with the minced garlic and Thai chilies (if using). Cook for about 30 seconds. Add the cooked noodles in batches to the mixture. Reduce the heat to medium and pour the wine, soy sauces, and sesame oil on top of the noodles. Toss the mixture with tongs to fully incorporate the sauce and to distribute the vegetables throughout the dish. Add white pepper to taste and serve immediately. Garnish individual dishes with sriracha or other hot sauce, as well as a drizzle of light soy sauce to taste.